Not to worry. We always need more clocks. So I repurposed Etherclock for the family room. We had a Squeezebox serving the purpose of a really accurate clock in that room. But I felt bad to be putting it to such a meager use and my friend Jon wanted a second one, so I sold it to him and started on Etherclock. First I chose the Tuxgraphics ethernet board. This is a nice, small board that has a mega168 and an ENC28J60 for ethernet. The ethernet chip runs at 25MHz and can output a clock signal which is 1/2 that, which drives the mega168 at 12.5MHz. That’s slower than it’s maximum rate of 16MHz, but it was plenty fast enough for this project. And it was an easy matter to get a precise 1sec time reference using the 16 bit timer/counter of the AVR. Plus it has a nice little prototyping area on one side, and an LED for some early stage debugging. 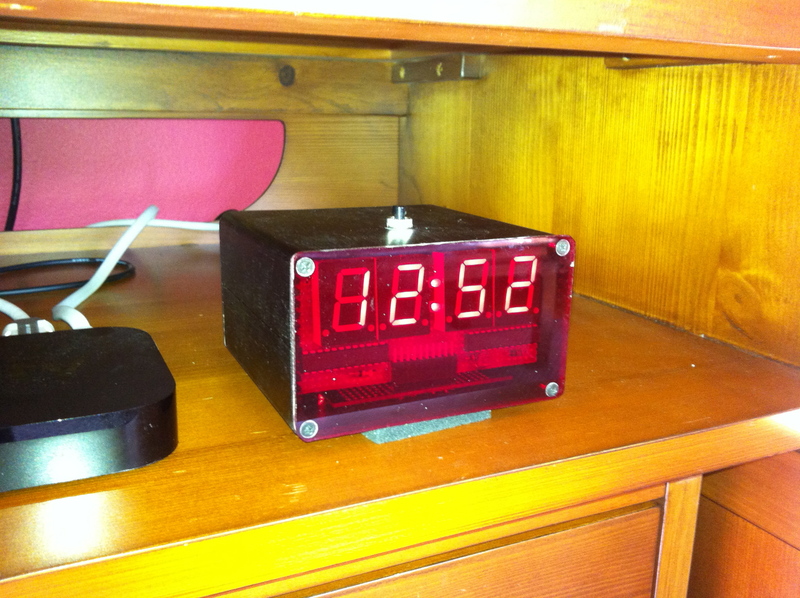 I wanted the clock to have nice big digits, so I decided on 0.8″ red 7 segment LEDs (LSD8161). I wanted them to be bright enough and have nice even brightness, so I opted for a shift register with constant current outputs. The MAX6969 is a great part for this. It has 16 outputs, so I only needed 2 parts to drive 4 digits, and I didn’t have to worry about multiplexing. 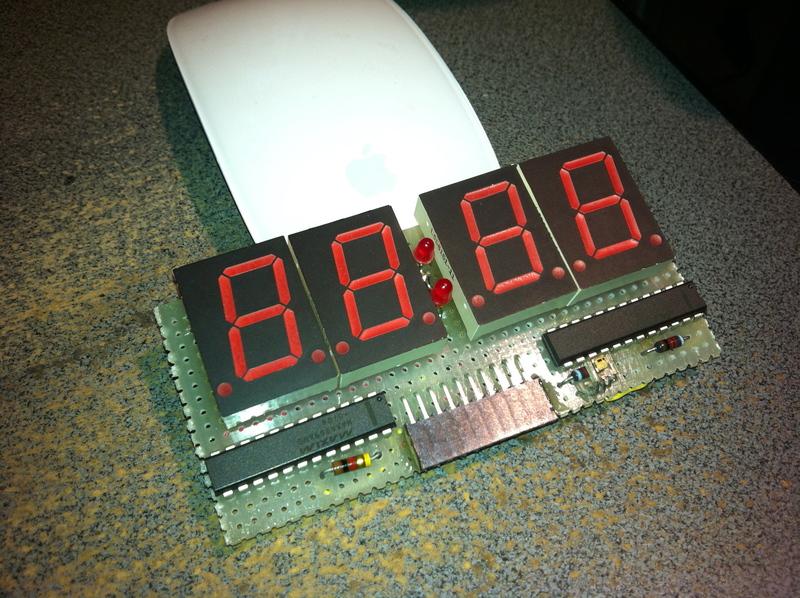 I just needed 4 pins: data, clock, enable and latch. I set the current on the MAX6969 to maximum and used the enable signal to adjust the brightness. 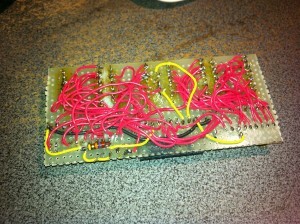 I breadboarded one digit to test the serial interface and brightness control. It was convenient to use my STK500 board for the testing phase, using the same mega168 at the same frequency as the final project. 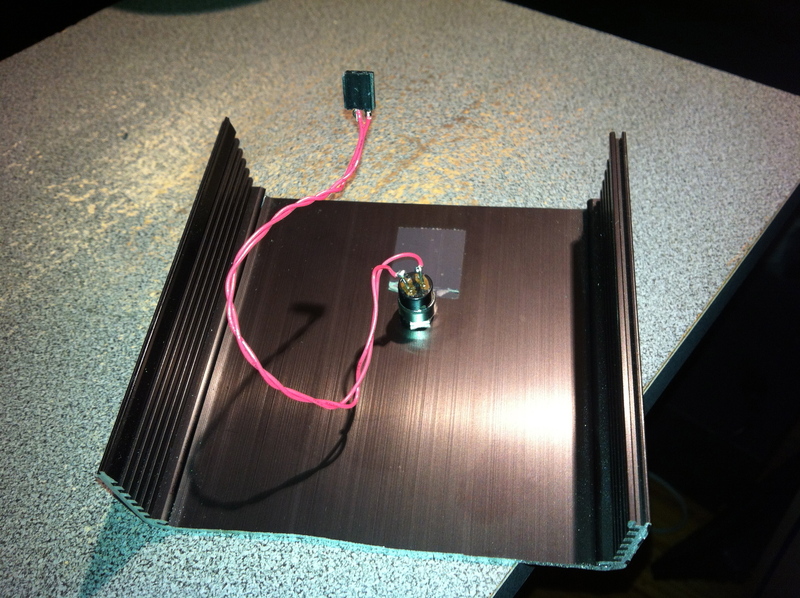 I also used this setup to test the IS474 light detector, used to automatic brightness adjustment. 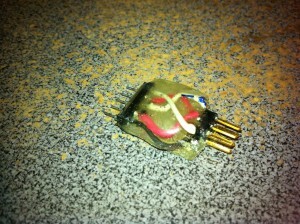 The IS474 outputs an analog signal from 0 to 5v, which I brought into the ADC0 pin of the Mega168. The incoming light level determines the percentage of time the LEDs are on, so they’re brighter in a bright room, and get dim when the room light decreases. I knew I wanted to try writing code for Etherclock in C++, partly because I have used it for many years at work and partly because I read so many AVR articles claiming it was a bad idea 🙂 So I started writing Marrinator, a C++ library to interface with all the internal and external hardware used in the project. For a while I even toyed with writing my own toolchain, but things have gotten better since then and I abandoned that project. I made up my own Makefile and was running everything from the command line for a while. But I finally settled on using Xcode for development. It is perfectly capable of using an external Makefile and toolchain for building and made it much easier to find and fix compile errors. Just for fun I played around with the Arduino development system a bit. It’s not hard to get Arduino to work with non-standard boards. But I found that the libraries and development system didn’t really give me much from my roll-your-own approach, so I went back to Xcode. When I started the project I was using an STK500 both for hardware prototyping an downloading the firmware to the chip. When it came time to move to the real hardware I had a problem. 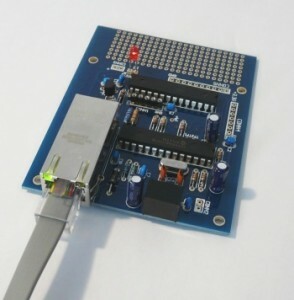 The STK500 is perfectly capable of programming external hardware, using the standard 6 pin ICSP connector. 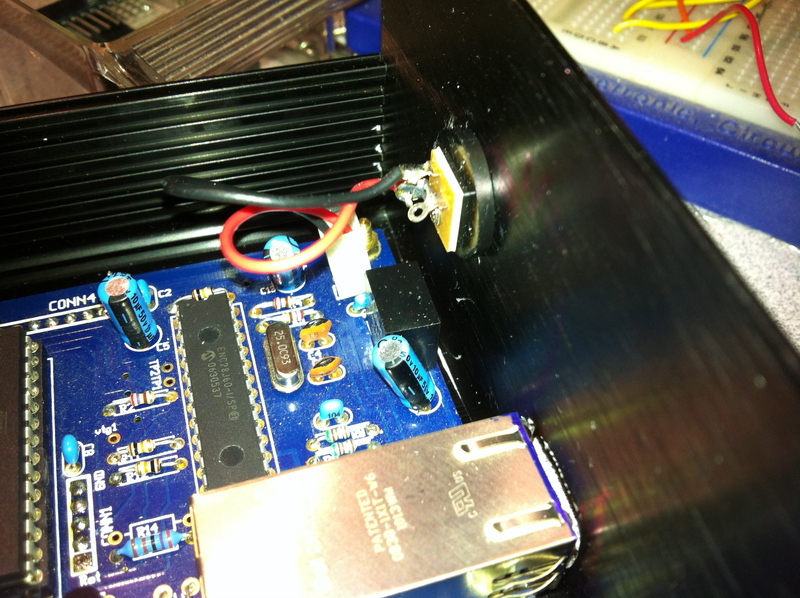 But the Tuxgraphics board has a 5 pin inline connector instead. So I built what I called The Abomination to interface the two. Now, on the face of it, it’s not so bad. It’s just a 6 pin IDC to 5 pin inline adaptor, embedded in epoxy. And this worked fine with the STK500. But later on I bought a Dragon, thinking I would be able to use DebugWire for some hardware debugging. 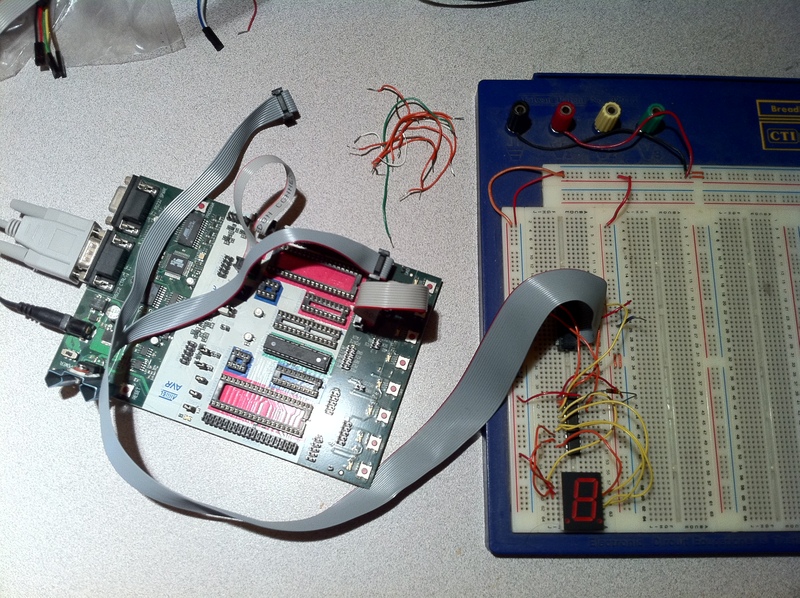 That hasn’t happened (yet), but I also started using the Dragon to program the Tuxgraphics board. Of course, that didn’t work. Just look at The Abomination. 6 pin IDC to 5 pin inline. Where’s the missing pin? Turns out it carries VCC, and the Tuxgraphics board has no connection for it. That was fine with the STK500, but the Dragon wants to see VCC to know what voltage it should be programming at. No VCC, no programming. 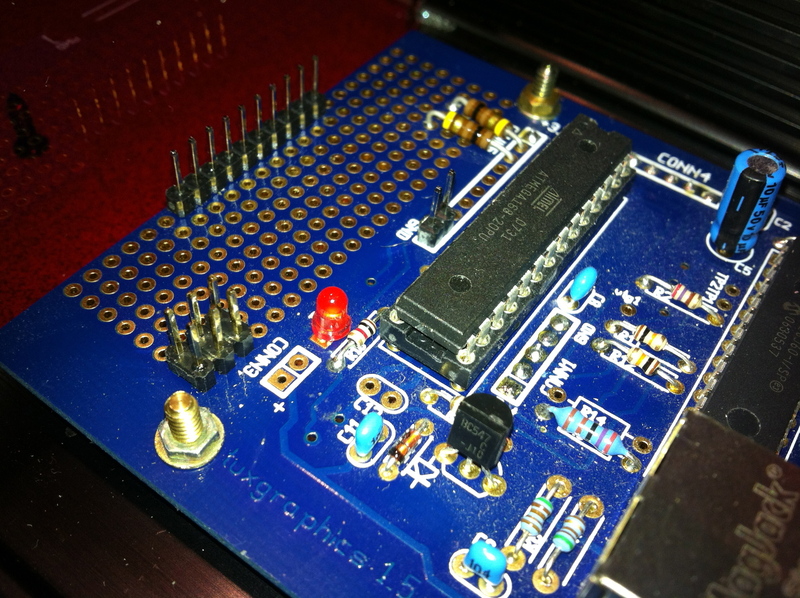 So I simply added a 6 pin IDC connector to the prototyping area of the Tuxgraphics board, brought in the 5 ICSP pins, added in VCC and was in business. I put the 2 MAX6969 chips, the IS474 light detector and the 7 segment LEDs on a separate display board, mounted at a right angle to the main board. This made for a nice compact design which didn’t need any additional mounting for the display. The parts were mounted on a piece of perfboard, which meant soldering. Lots of soldering. I used to really like soldering. But display boards like this are an entirely different experience. It consists of around 50 wires, or 100 connections. Shockingly, it worked perfectly the first time I wired it up, which is clearly a tribute to steady hand and high quality tools – or the beer. The only other parts and connections were a button on top of the case and the power connection at the rear. I didn’t use a polarized connector for power, but I will always try to do that in the future. I haven’t fried anything (yet), but I worry every time I connect power. The button mounted in the top. Always use a connector for something like this, so you can disassemble it easily. The back panel has cutouts for power and the ethernet connector. For ethernet I drilled a round hole and then used the dremel and a file to square it the best I could. The cable fits fine, so I didn’t worry about the look too much. 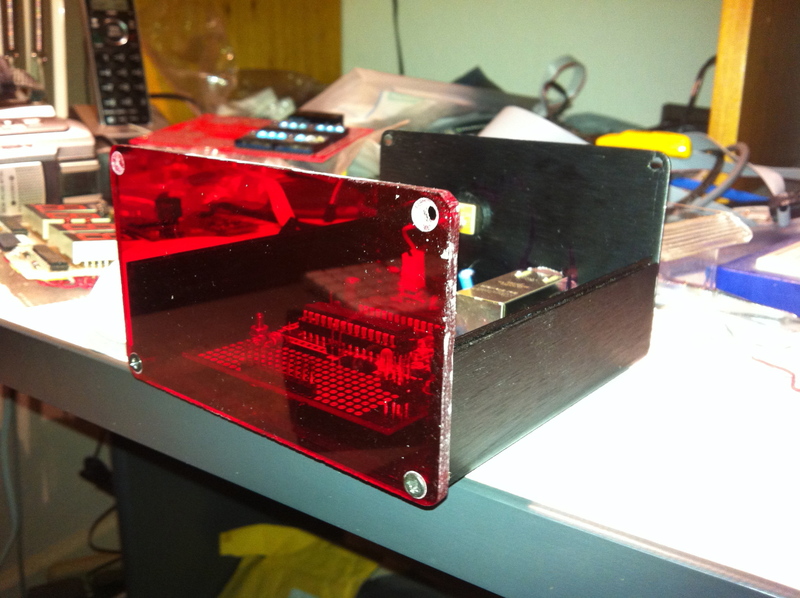 The case is a Context Engineering split body aluminum box. This is basically 2 pieces of extruded aluminum that fit together, so you can cut them to any length. I cut it to the perfect size with a band saw, which was easy once I had the right blade! But you might notice in the picture above that the cut is a little ragged. Next time I’ll add a fence using a piece of wood and a couple of clamps. I did this for the plexiglass front and it came out perfect. Once the hardware was done, I just had to write all the software, which I’ll discuss in a separate article. Hi, my name is Chris and I have lots of hobbies. From woodworking, to Shapeoko, to IoT and other hardware projects, you’ll find it all here. I’ve been a professional software engineer for all of my life so my hardware and IoT projects always include a software component. My interest in IoT has lead me to the ESP8266 and to my m8rscript software project to drive it.